Dr. Katherine E Dadisman, DO is a Doctor primarily located in Belleair, FL, with another office in Seminole, FL. She has 24 years of experience. Her specialties include Obstetrics and Gynecology. She speaks English. Dr. Dadisman has received 1 award. The overall average patient rating of Dr. Katherine E Dadisman is Great. Dr. Katherine E Dadisman has been rated by 28 patients. From those 28 patients 13 of those left a comment along with their rating. The overall rating for Dr. Katherine E Dadisman is 4.0 of 5.0 stars. I have been a patient of Dr. Dadisman's for approximately 15 years. I appreciate her professionalism and friendship! Would not see anyone else. I've been a patient of Dr. Dadisman for years and she's helped me through some difficult issues with humor and care. I enjoy her pleasant demeanor. She is knowledgable and thorough and always makes me relax when I have an exam. Most importantly, she recently saved my sister's life during a severe complication resulting from a c-section performed by another doctor. I will be a patient for life. In for years of many gyn doctors, Dr Dadisman is by far the best ever! Very calming and personable and really cares for her patients. Dr. Dadisman is a wonderful doctor! I had been having unusual problems and had been to MANY gynecologists who basically told me to put on some creme and come back in a month. They didn't offer any real testing or treatment. Dr. Dadisman saw me and got the ball rolling immediately on what could be wrong. She even called me with an alternative treatment that I should try and it worked great...first relief I'd had in months. I have seen her for three years now and wouldn't have any other doctor. She explains things completely, listens to me, never rushes me out of her office, and is straight forward, which I appreciate very much. I would highly recommend her to ANYONE needing a gynecologist! Not only that, if I could find a primary care doctor of her caliber, I'd be ecstatic!I've been going to Dr. Dadisman for my well-woman exams for years and she's always been thorough, answers my questions, and always treats me with respect (which is rare among doctors). Her staff has always been very pleasant, and efficient at scheduling appts. and working with me to coincide with my schedule, and remind me of any follow-ups that I need.The facility is state-of-the-art (in my opinion) and they seem to be up on the latest diagnostics and treatments.I just couldn't ask for better! Dr. Katherine Dadisman is board certified in obstetrics and gynecology. Her special include adolescent health, prenatal care and delivery and menopausal health. Take a minute to learn about Dr. Katherine E Dadisman, DO - Obstetrics and Gynecology in Belleair, FL, in this video. Dr. Katherine E Dadisman is similar to the following 4 Doctors near Belleair, FL. 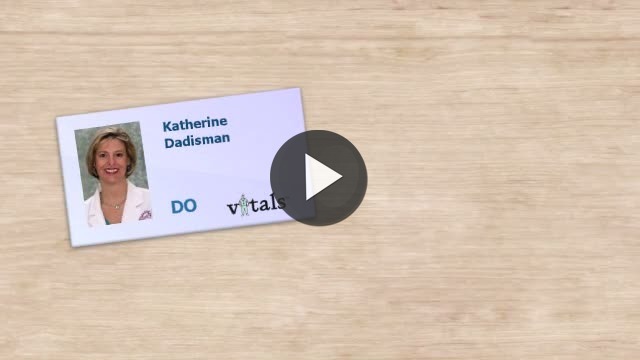 Have you had a recent visit with Dr. Katherine E Dadisman? Select a star to let us know how it was.